Laser scanning technology cuts costs for wall panel manufacturing for existing buildings. 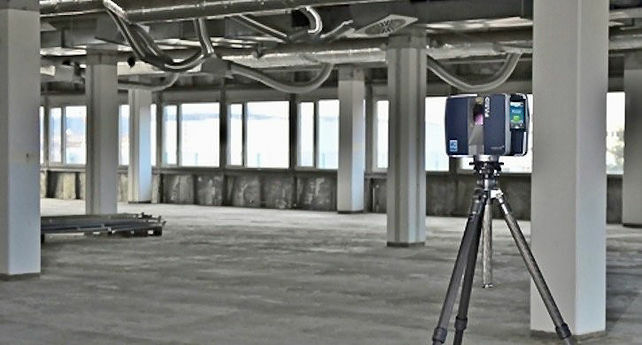 When it comes to technology in the construction industry, there’s a new kid on the block: 3D laser scanning. This process creates digital images of existing structures and objects to build a 3-dimensional (3D) CAD (computer-aided drawing) model. The models provide accurate designs for modifications, renovations, and repairs to those structures and objects. The key to this technology is the “point cloud,” which is created with a 3D laser scanner and consists of millions of data points to define the size, location, and shape of the space. The point cloud helps produce the 3D model of the space, providing precise and detailed specifications for design modifications. Data collection is much faster and less expensive than by traditional methods. The location and dimension data for objects are highly accurate. The actual state of the structure is represented without depending on drawings and other documentation that may not be available or up-to-date. Improved planning and design due to easier analysis of conflicts between new elements and existing structures. Laser scanning is safer for the crew capturing the data because of reduced time and reduced exposure in high risk sites. At Vertex Systems, we are excited and proud to announce full support of this technology in Vertex BD, our flagship building design software. 3D scans can be imported into Vertex BD and the designer can start detailing directly on the point cloud image. Vertex BD will generate panel fabrication drawings, material reports and export manufacturing data for production. This video will give you a preview of how to utilize laser scanning technology to design and manufacture a cold-formed steel wall panel into an existing building.